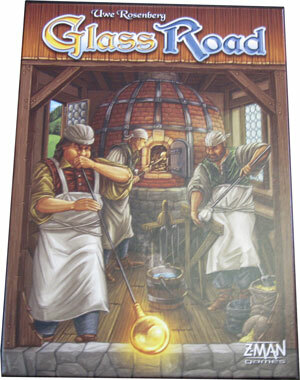 Glass Road, designed by Uwe Rosenberg (best known for Agricola and other worker-placement Euro strategy games), commemorates the 700-year-old tradition of glass-making. The Glass Road is a 150-mile path through the Bavarian Forest near the border to the Czech Republic, a remnant and reminder of the great days of glass production. In the game Glass Road, your job, should you choose to accept it, is to produce glass and bricks. Glass to suit the theme. Bricks – along with some wood and clay – so you can build the buildings that will give you the victory points that will determine whether you to win the game or not. To accomplish the tasks of producing glass, bricks and other resources and building buildings, you’ll need the help of a variety of specialists represented by cards. At the beginning of each of the four building periods, you’ll choose five of the 15 Specialists available to you (each player has an identical set) to potentially play that building period. You always get to choose your five cards from among all 15 Specialists regardless of what you played in the previous building period. After secretly choosing your five Specialist cards for the current building period, over the course of three card rounds, you and your fellow players will each pick a card from your hand and put it face-down in front of you. Then one-by-one, you’ll reveal your Specialist card and resolve it immediately. If no one else has the card you played left in their hand, you get to perform both of the Specialist’s abilities. Otherwise, you only get to perform one of the Specialist’s abilities and the other players holding that card in their hand must also play their card (in clockwise order) and can perform one of the Specialist’s abilities. You don’t have to use the ability of a card you play. Some Specialist cards have an entry fee on their left which you must pay before using any of its abilities. You only have to pay the entry fee once, even if you use both abilities. You don’t have to pay the entry fee if you play the card without using its abilities at all. Exploiting the abilities of the Specialist cards lets you collect resources, place new landscape tiles (ponds, pits, and groves), and build a variety of buildings. There are three types of buildings: 1) processing buildings, 2) buildings with a one-time immediate effect, and 3) buildings that provide bonus points at game end. The resource tracking is one of the most interesting and unique features of Glass Road. 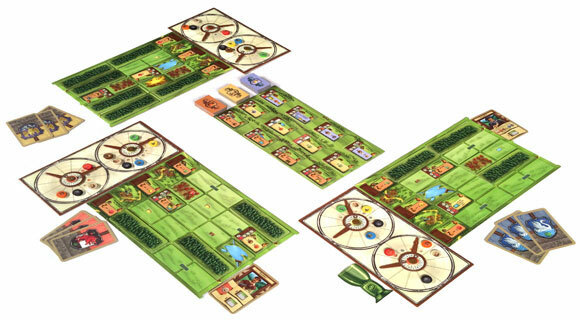 Each player receives a board with two production wheels on it, one for glassworks and one for brickworks. In order to produce glass, you’ll need to acquire sand (a necessary component of glass), porridge (to feed your workers), coal (to stoke the fires), water (for manufacturing and cooling) and wood (wood ashes are a necessary component of green glass). To produce bricks, you’ll need coal, clay, and porridge. When you acquire the resources for glass, move the appropriate discs a number of sections clockwise around the wheel. Whenever you create an empty space directly next to the long wheel hand (clockwise), you must move the hand clockwise until it is again blocked by a disc. For instance in the picture above left, if you acquired three sand, you would pick up the yellow sand disc on the glass wheel and move it from zero to the section numbered three. After doing that, the sand section on the wheel would be empty, requiring you to move the long hand on the wheel one section clockwise, thus producing one glass. In the process, you would use up 1 water and 1 porridge (now at 0), 1 sand (now at 2), and 1 coal and 1 wood (now at 5). The brickworks wheel works similarly. After playing three card rounds, the start player goblet rotates to the next player. Players pick up all of their Specialist cards and choose five for the next building phase. Play continues thusly until four building phases have been conducted. 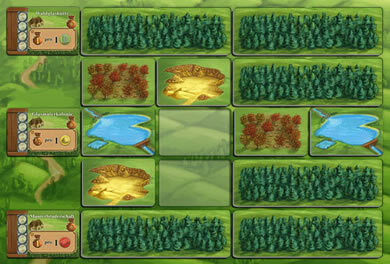 Players then add up the points of their buildings and bonuses provided by buildings. The player with the most points wins. Mastering the balance of knowing the best specialist card to play and being flexible about when you play it – together with assembling a clever combination of buildings – is the key to Glass Road. Glass Road supports 1 to 4 players, ages 12 and up and takes about 20 minutes per player to play. In the first game I played (4 players), the play time was actually shorter. Here Be Books & Games has a Glass Road in their Game Library. They’ll even teach you how to play! Copyright © 2014-2016 by Tina G. McDuffie. All rights reserved.